Amy Fowler struck gold twice at the recent NZIPP Iris Awards, with her two award-winning prints landing her the Student category win for the second year in a row. A student at the photography department of Palmerston North’s Universal College of Learning (UCOL), Amy chats to D-Photo about the provocative portrait that helped secure her this year’s title. D-Photo: Was this image produced for a UCOL assignment? Amy Fowler: Yes, it was an assignment for UCOL, I had the upcoming NZIPP Iris Awards in mind when I started to produce the image though. The brief was very loose, we had to produce a set of five images that flowed well together with the aspect of colour in mind. I wanted to step out of my comfort zone for this assignment and push the vibrancy of the colours. The concept was based on Distortion by Proxy Disorder, which is an issue where parents try to live their own lives through their children. This project in particular was based on beauty pageants and how commonly the children participating don’t want to be involved but parents are spending thousands of dollars on their children's make-up, dresses and sometimes plastic surgery. Quite often this leads to depression, self-esteem issues other emotional disturbances later on in life. 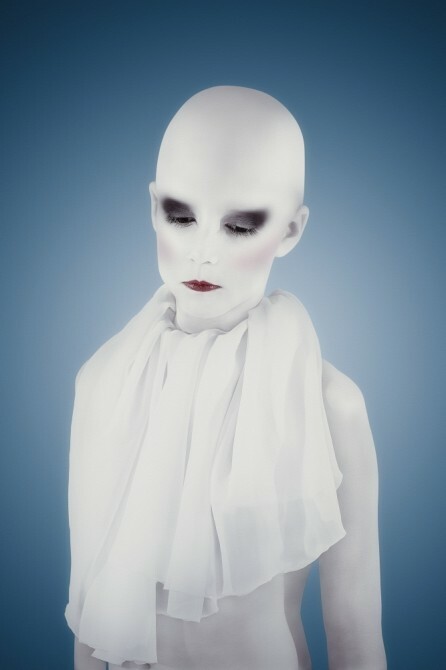 I expressed these issues through the series by having the child pale and lifeless to symbolise their suppression of personality, the bald head is to show loss of identity and the make-up, which is specific to this piece in the series, is to show how the child is having to grow up faster than she should. Maddie is a beautiful little nine-year-old daughter to a good friend of mine, she has a lot of experience in front of the camera so it was easy to work with someone so open to any concept you could dream up. I explained to her the topic and allowed her to then express her feelings about the subject, with little direction from me we blasted out the images ready for Photoshop. Could you outline the gear and set-up you used for the image? I used a Canon 1Ds Mark III with the 85mm f/1.2L lens, studio lighting supplied by UCOL (Bowens 1000s) and a white backdrop. The simpler the lighting the easier it would be for post- production. What was your biggest challenge on this shoot? I didn’t spend long in the studio with this project. The hassle came in post-production, when I had to remove the full head of hair in Photoshop retaining as much skin texture as possible! What made you pick this image for the Iris Awards? The image was very personal, I poured hours into the image and I felt it was the strongest image I have produced to date, so I wanted to know how well it would do. I also had a lot of feedback from my peers, lecturers and Kelvin Gilbert, my partner in crime, saying that it would be a good image to enter. Did you see the judging of the image? I watched the judging online from home with a great deal of anticipation and nerves, Russell Hamlet said “simplicity is the hardest thing to interpret” and tried to talk it up into Gold Distinction (96 being his final score, thank you!). I was absolutely blown away by how much they loved the image and when you’re in the moment, listening to your image being judged by some of the top photographers in New Zealand it is very scary! How did the image go over with your teachers? I received a good mark for my series, which is always a small reward in itself. They pushed me to enter the image into the NZIPP Iris Awards believing it would do well. You've won the Student category for the past two years – what's the next step for you? I am just ten days away from handing in my final assignment! I graduate in March of next year but officially finish my degree in November, which is going to be strange but is a rewarding relief seeing as I have spent so many years working towards this. My partner, Kelvin Gilbert, has started our business, Novo Retouching, and I will be joining him as soon as I have finished the degree, which is very exciting as we will be heading to Auckland and expanding into the photographic side of the business.